Soldiers lined up to taste ceviche and other Hispanic foods prepared by the 11th Armored Cavalry Regiment and the National Training Center culinary team for Fort Irwin’s annual Hispanic Heritage Month celebration, held September 27 at the Sandy Basin Community Center. FORT IRWIN, Calif. — Music, dancing, ceviche and salsa marked the celebration of Hispanic Heritage Month at the National Training Center and Fort Irwin on September 27, hosted by the 11th Armored Cavalry Regiment and the Fort Irwin Equal Opportunity offices. 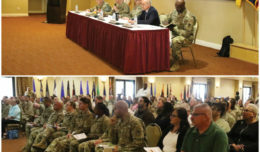 The annual observance highlights the many achievements of Hispanic American Soldiers and Civilians, of which there are currently more than 66,000 serving in the Regular Army and more than 133,000 serving in the Total Force. Mr. Ted Alejandre, Superintendent of Schools for San Bernardino County and a lieutenant colonel in the U.S. Air Force Reserves, gave the keynote address, followed by performances from the Los Angeles Ballroom Academy. Before the celebration, Alejandre spoke with Fort Irwin’s 88.5 KNTC “The Heat” about his military career, the importance of diversity, and how schools in San Bernardino County are “Shaping the Bright Future of America”. Q: To begin, could you tell us a little about yourself and what you do in your role as County Superintendent for San Bernardino County? I was born and raised in San Bernardino, so I’ve been in San Bernardino County my whole career. I was very fortunate to be elected County Superintendent in 2014. These are really historic times in education because of some major changes that have taken place in public education in California over the past four years, and our role really is to support every one of our  districts so they can achieve the goals they’ve established with their communities. My dad was a chief master sergeant in the Air Force, and I decided to enlist in the Air Force. I completed four years of active duty and decided I wanted to stay in and be affiliated with the Air Force. I just celebrated my 33rd year in the Reserve program, and I’m currently the deputy director for the Air Force Academy liaison program for San Bernardino-Riverside Counties. Q: You have a long track record of public service, both in the military and civilian worlds. How did you first decide that this was the path you wanted to pursue? When I was going through high school, I don’t think I had the opportunity of knowing what opportunities there were. I knew that my father was in the military and the Air Force, and that’s a pathway I wanted to follow. It was an incredible experience being on active duty and then in the Reserves, so I don’t hesitate for one minute to support military service to any young person. What we really try to do for young people across our county is really provide them with options and information and different types of avenues that they can take. That could be military service, it could be going to community college, it could be going to a four-year institution, it could be going into industry certification — but really try to see where are the interests of a young person and how can they pursue that interest and passion so they can be successful adults. Q: Today, we are celebrating National Hispanic Heritage Month. What makes Hispanic culture so vital to the character and success of Southern California, and the country as a whole? I think there are two things for me, personally, that stand out. Both my parents are Hispanic, and one of the things that both my parents modeled for me every minute of every day is work ethic. I encourage young people all the time—no matter what job you have, give 150 percent because people notice that and then they give you other opportunities. The second, that’s equally important, is family. I come from a large family; I have a lot of cousins. Every year we have a family reunion in the summer where we bring together nearly 300 cousins and aunts and uncles, tias and tios as we call them, and we just have a great time. Before the reunion, we get a handout that says who’s graduated from high school, who’s graduated from college, who’s had a baby, who’s gotten married, and so you’re connected to your family and it’s just wonderful to be among that kind of environment because it is so supportive. Q: How does diversity make our military, and our communities, stronger? When we celebrate the diversity of each other, we then start to respect and work together in a stronger way to support the needs of the mission that we have. 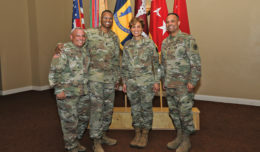 When I was in the 701st and we would deploy out to Osan Air Base in South Korea, just being around such different individuals – whether they came from an Anglo background, Hispanic background, African-American background, or any other background – we respected each other because we were all tied to the mission. We see it in sports, we see it in academic competitions, we see it across the board in so many different areas, that when we work together as a team and respect the background and diversity we have, it makes us much stronger. Q: The theme of this year’s observance is “Shaping the Bright Future of America”. How can we ensure children of all backgrounds have the resources they need to succeed? In our county, our 33 school districts have all adopted what’s referred to as our Cradle to Career Roadmap. What’s most important is that every one of our districts wants to prepare our students for the future. In doing that, they’re not looking at past models, they’re looking at where are the industry sectors of the future that have jobs, that have those opportunities, and how can we make curriculum, especially high school, relevant? When you see students in a classroom involved in a collaborative, inquiry-based activity, then you can just see that passion for learning take place. And when you have students in that kind of mode, there’s no limit to what they can accomplish. But it’s up to us to provide those environments. 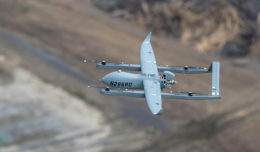 Q: People come to Fort Irwin from all over the country, and all over the world. Do you have any advice for our community about how to experience, and respect, the Hispanic heritage here in Southern California? The event today is one way for sure. But on an ongoing basis, what I encourage so many people to do is to tell your story. When young people hear about people that they think are very successful, and they think that they just went from one to the highest, they don’t understand all of the different levels and experiences that person has. So I always encourage Hispanic leaders and African American leaders and others to take time to meet with student groups, meet with other types of committees or associations, and tell their story. Because when we hear from each other, we learn so much. Editor’s note: This Q&A was adapted from a radio interview with Mr. Ted Alejandre on September 27, 2017, originally aired on 88.5 KNTC “The Heat”. It has been edited for length. Dancers from the Los Angeles Ballroom Dance Academy performed at Fort Irwin’s annual Hispanic Heritage Month celebration, held September 27 at the Sandy Basin Community Center. 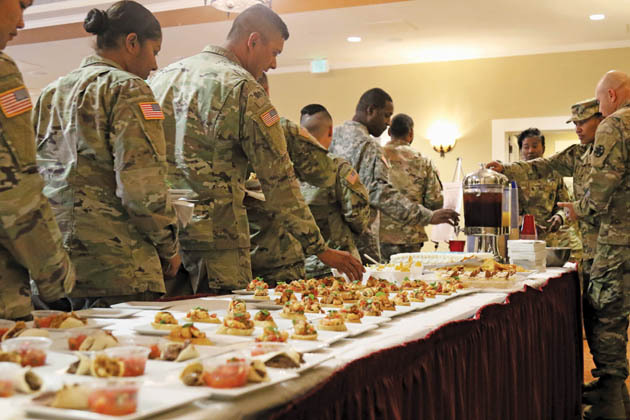 The event also featured guest speaker Mr. Ted Alejandre, Superintendent of Schools for San Bernardino County, and a menu of Hispanic food prepared by the 11th Armored Cavalry Regiment and the National Training Center culinary team.